Heat oven to 450°F. Bake pie crust as directed on box for One-Crust Baked Shell, using 9-inch glass pie plate. Cool on cooling rack 15 minutes or until completely cool. In 3-quart saucepan, heat water to boiling over high heat. Stir in chai mix; reduce heat to low. Using wire whisk, stir in marshmallows and butter. Continue stirring just until marshmallows are melted. Stir in caramel syrup. Refrigerate about 30 minutes or until cool and thickened. In chilled medium bowl, beat whipping cream with electric mixer on high speed until stiff peaks form. Set aside 1 cup whipped cream. 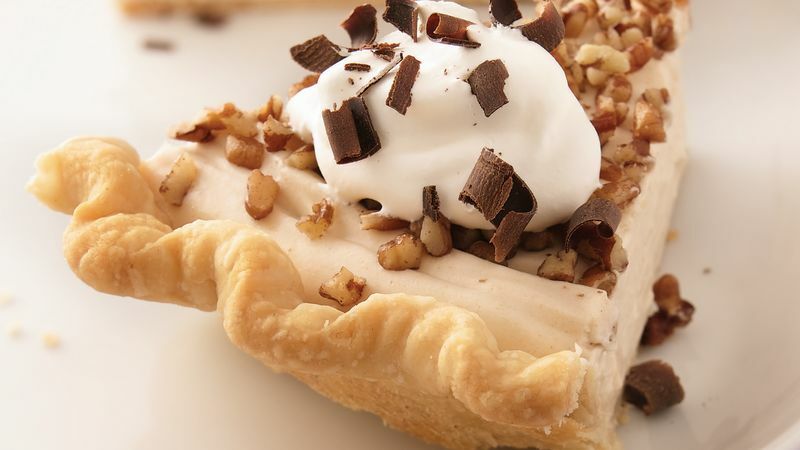 Fold remaining whipped cream into cooled filling. Pour into cooled pie crust. Sprinkle with pecans. Cover; refrigerate about 2 hours or until filling is set. Garnish with reserved whipped cream and shaved chocolate. Cover and refrigerate any remaining pie. Chai tea mix comes in an assortment of flavors. We tested the recipe with black tea, honey, vanilla & spices. Don't like nuts? Feel free to leave them out.